This Simca saloon is an ordinary standard Dinky of the 60's. It was available under the reference 523 from october 1963 until 1969 in either blue or metallic grey with red inetrior, bare metal concave hubs, black treaded tyres and jewelled headlights. Yellow box with diamond cutting to see the colour of the model inside, three pieces of luggage were provided in a small celophane bag. A darker blue model is known but it is probably a colour sample. What is special about this model is that a few days ago our american friend collector Jose Heraud sent a link to a peculiar eBay item. The item in question looks like a box. 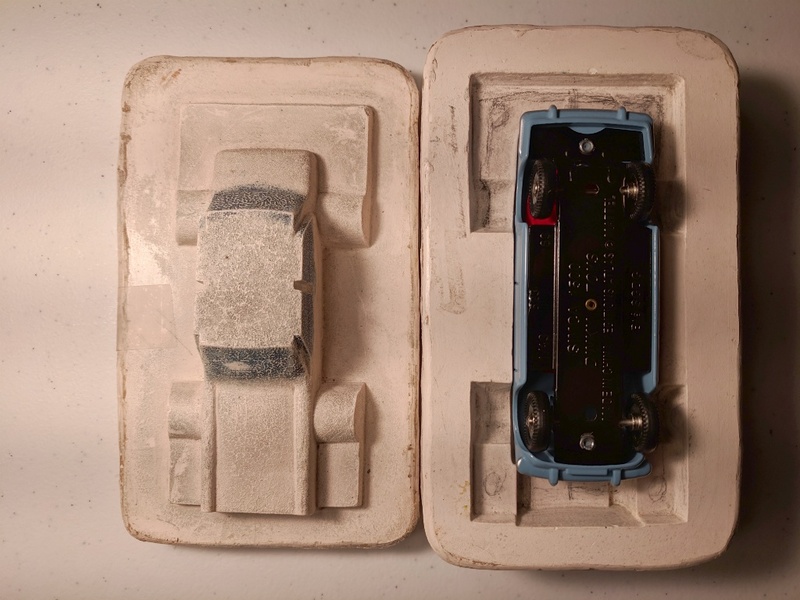 It is made of hard plaster and it is marked SIMCA 1500. In fact this box is something called a master copy. It has been used to make the die for the Simca 1500 saloon. It is not a mold as advertised on eBay. The master copy was over moulded on the wooden master model to obtain a negativ shape of the future toys. It was placed on a copying milling machine which cut in the mould the cavity in which the Dinky would be cast. Making a master model at Binns Road, two elements of a master copy are visible at the rear of the picture. a mould been cut. The master copy is on the right and the die been cut on the left. This is the only master copy known for a Dinky Toys. A couple have been preserved for some Solido models. Jacques. Thank you very much for your instructive explanation of this tool and how it is used in practice. I have become a lot wiser again how a miniature is made in practice. Jose often finds very special and interesting items on Ebay or auctions or has some other interesting questions or findings. It's a pity that he is no longer a member of the DTCA and can participate in our forum. Then we can communicate with him directly and with each other in a larger context. I know that Jose mostly reads the forum contributions, so Jose when you read this: Please become again a member of our forum. That makes our forum even more lively. The master copy was sold today for 110€ + 68 € for shipping to France. But, of course, I don't know the nationality of the new owner ! Now it can be told that I purchased the master copy -- it seemed a shame not to! It fits the Simca 1500 model pretty well but there seem to be some discrepancies. However, the model pictured is an Atlas replica -- I find this particular Dinky too boring to want to pay the going rate of around $150 for a mint sample! -- so it is hard to be definitive. Perhaps this is the master copy for some other manufacturer's 1/43 Simca? Perhaps the Politoys? Here is a photo I found comparing that one with the Dinky. Regardless, I think it is a nice artifact to have. 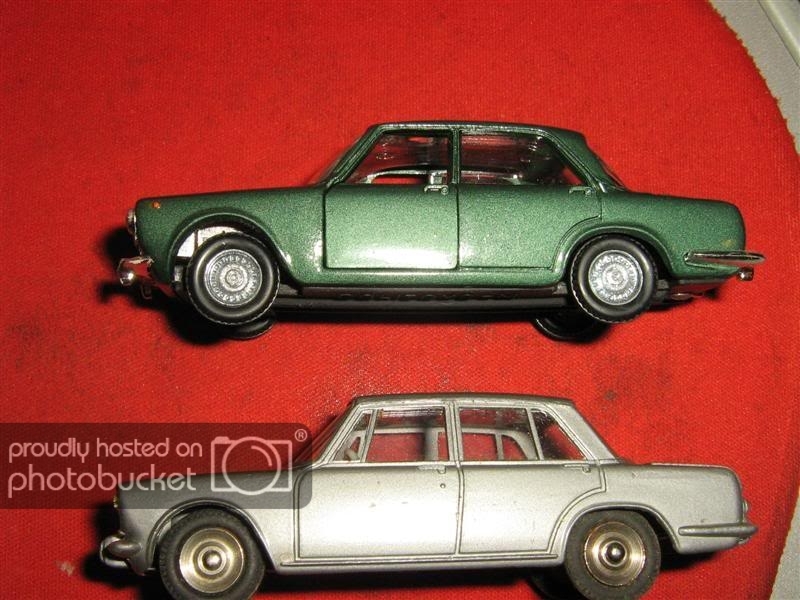 An interesting comparison between the Dinky and Politoys versions of the Simca. It would at first appear that the master you have is for the Politoys version, notice that there are no quarterlight window pillars whereas the Dinky model does have them - yet the Politoys also has opening doors, and there seems to be no provision for them on the master. Certainly a mystery ! Congratulations for your purchase of this rare item. It is peculiar that this master copy is at the 1/43 scale. They were usually at twice this scale. i.e. 1/21,5. I still can not say if it is Dinky or else as the missing quarterlight window pillars argument does not stand. It was common practice to add details directly into the moulds. Note that the rear lights are not in the master copy. Anyway, a nice piece of history. Thank you for your comments! While I would certainly like to know if this is a Meccano Ltd. item, I'm glad to have it regardless, since as you say, it is a nice piece of history!